Since 2010, Lipe & Sons, Inc. has been your go-to dealer for grain storage products and handling equipment. We specialize in the sale of and can facilitate the assembly of grain elevators, handling equipment, and bins. Lipe & Sons, Inc. is your go-to source for a high-quality, affordably-priced grain bin in Illinois! If you’re looking for grain storage, you don’t need to look anywhere else. We’re an authorized distributor for some of the best brands on the market—including Superior, Hutchinson/Mayrath, NECO, Creamer Metal Products Inc., Sudenga, Conrad American and more! Best of all, we’re knowledgeable about all of the products we sell and can help you get the perfect equipment for your agricultural operation. Whether you’re looking for a standard grain elevator in Illinois or you need expert insight into a silo with a pneumatic air system, we’re here to help. We’ve been a locally-owned business since 2010. 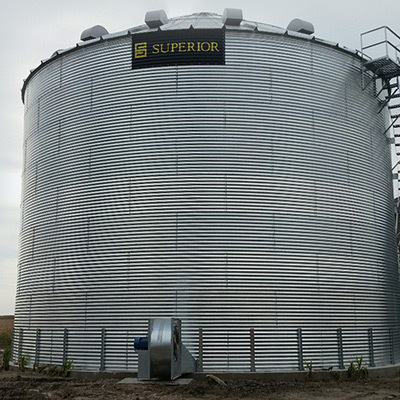 We offer some of the top brands and styles of grain bins, including Superior. Our team has more than 30 years of experience in the industry. We’re ready to offer you a free quote on products and services. Looking for a grain bin and handling equipment to meet the needs of your agricultural operation? Consult with us today for a free estimate on products that are right for you! "Not only are you going to find the best prices with Lipe and Sons, you're going to get top quality work from genuinely GOOD people. There is..."
"I built a 50,000 bu Grain Bin, and could not believe the price difference from other companies. Lipe & Sons, Inc. price was over $15,000 les..."